Nicole Holofcener’s name has been all over the Toronto Film Festival this year. She wrote the screenplay for the new comedy-drama Can You Ever Forgive Me, a project she stepped away from to direct her sixth feature. 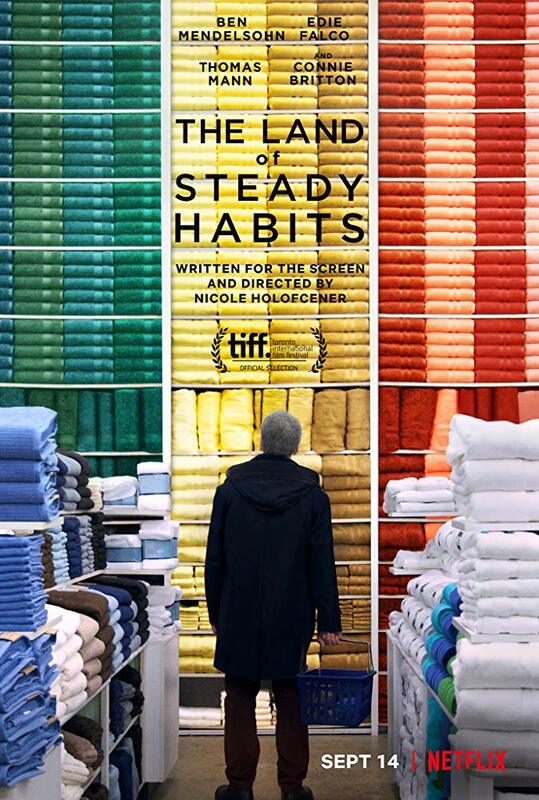 Adapting Ted Thompson’s novel The Land of Steady Habits, Holofcener focused her dramatic-comedy on a male protagonist; her first feature without muse Catherine Keener. The film stars character-actor Ben Mendelsohn, taking a break from villainous roles, as newly retired Anders Hill, ex-husband from Helene (Edie Falco) and father of an adult son (Thomas Mann). With his new life, however, he finds that it yields no additional happiness. Despite the film’s tragic turn, Holofcener looks at the male psyche with the same critical, yet empathetic eye as she did in her previous female focused films. Lesley Coffin: How did the book initially come to your attention? Nicole Holofcener: The way a lot of projects come to me. My agent just sent it to me and said I should read it. I get sent a lot of books, so I never ask him why he thinks I should consider one book over another. And I don’t think they ever know which books will interest me. They’re surprised when something does. But I read it and told them, “I like this book. I want to make this film.” I can’t even explain what it was about it exactly. Lesley Coffin: Because all your previous films had been female-focused, was this a different experience, in terms of finding the film’s point of view and perspective? Nicole Holofcener: I’m sure unconsciously, I mean I’m a woman and my main character is a man. So I did have to put myself in his shoes. But with any character that isn’t based on me, I have to put some effort into creating them. But I don’t think his gender made any big difference in my approach? Lesley Coffin: One of the really nice touches in the film is how differently the friends talk. The friendship between Edie Falco and Elizabeth Marvel is full of problems, but they are far more open with each other than Ben Mendelsohn’s able to be when talking with Josh Pais. You get the sense that Anders has no close friends he can turn to. Nicole Holofcener: Most of the men I know don’t have “good” male friends. I think, from my perspective at least, that it’s hard for men. Most don’t have intimate male friends. I know some guys who say they do, but when I ask them what they talk about, it’s not personal stuff. They love each other and they are there for each other, but they don’t confide things to one another. I think men would sure benefit from more of that. And like a lot a men, a lot of fathers, his friends are the husbands of his wife’s friends. And when the marriage ended, those relationship just dissolved. And I think Anders is happy to be out, until he has no life. Lesley Coffin: And that lack of intimacy filters into the lives of the young men in the film. They also struggle to reach out and have personal conversations. Being the mother of sons, did you think about the opportunities you’ve seen for young men have to be emotionally vulnerable in writing Preston and Charlie? Nicole Holofcener: I’m always thinking about my sons, in everything I do. But there have certainly been times that I can see a little bit of Preston and Anders in my sons, when they push me away. I’m their mother, so I’m always wanting more from them. The same way my mother always wants to be with me, more than I even want to be with her. And that’s the natural order, you want your kids to push away and become independent from you. I don’t think my sons have found their intimate friends. They’ve had girlfriends, but I don’t know if they’ve found that friend yet. And they’re emotional boys, but they’re also dudes. Lesley Coffin: In Australia, Ben’s probably known for roles a little closer to the character of Anders, but in America he’s become famous as a villain. Had you seen him in anything that made you think of him for the role of Anders? Nicole Holofcener: Not specifically, although you made me want to go back and watch some of his Australian films. I generally trust that if an actor’s a really good actor, they can probably do anything. The one thing is, you can’t give an actor a sense of humor. They either have that or they don’t. But thank goodness, Ben has it. I’d admired him in a couple of things, but it was probably Mississippi Grind that made me see just how vulnerable he could be. It was a beautiful performance he gave in that film. But I probably just fell for him, as an actor, and really believed that he could do anything. Lesley Coffin: One of the big changes you made in the film was to cut out the various perspectives it had and choosing not to reveal some things about Helene until the very end. Why did you make the decision to keep the audience in the dark? Nicole Holofcener: I just felt that the film needed to be Anders’ story. We’re not with Edie Falco’s character that much when she’s alone. We’re only really alone with Anders and Preston. And there were many drafts where I changed the order of things. But I just felt things about Helene needed to be revealed to the audience at the same time they were revealed to Anders, and really put forth the idea that nobody’s perfect.